In their last few days before Commencement, many MIT graduates enjoyed the annual Senior Week, filled with events and activities for seniors and their guests. A major Senior Week event was a barbeque and field day for about 150 people. Other main activities included a Harbor Cruise, a Boston Pops concert and a trip to Rhode Island for games and a clambake, which had a turnout of about 200 people. "The turnout has been really great for all of the events," said Senior Class President Salman Khan '98. For families and friends arriving for commencement celebrations, there was also a Duck Tour of Boston, a pancake breakfast with President Charles M. Vest and a reception welcoming students to the Alumni Association. A new event initiated this year was a volunteer project at the Cambridge Community Center where a group of seniors spent an afternoon playing with children. 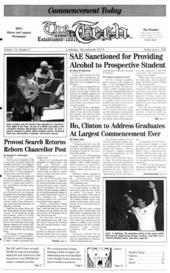 In addition to providing good times for the graduates, Senior Week is designed "to celebrate graduation and to help bring the class together," said Peter Muise, coordinator of reunions and class events of the alumni association. While some of these events were planned and sponsored by the Senior Class Council, others were headed by the Senior Week Committee, which is separate from the council and entirely funded by the MIT Alumni Association. "We had a committee of nine seniors who met starting in the fall to start planning events, survey the class, plan publicity" and work on other details, Muise said. "The events turned out even better than we expected," he added, noting the large attendance at the Senior Week events this year.